It is said that ‘’a bird took fire one day, tragically it burned it is own nest’’. Unlike the Israeli Mossad which carries out hundreds of assassinations each year, with the motto of leave no trace, has demonstrated the supremacy of the Israeli intelligence services in the Middle East. 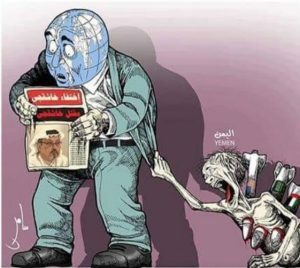 The case of the killed Saudi Journalist Jamal Khashoggi sheds a light of how badly the Saudi carried out the killing proceeding in contrast with the Israeli ones. Saudi Arabia which launched a military intervention in Yeman in 2015, with a coalition of nine African and Middle East countries, responding to what they justified a call by Yemenis President in exile Abdrabbuh Mansur Hadi for military support in response to Houthi takeover in Yemen, has caused the death, destruction and the displacement of many Yemeni civilians ,by which Yemen may face one of the worst famines in recent history. Once more, the entire world has been closely watching the death denials of Saudi authorities of the slain journalist Jamal Khashoggi, nevertheless, the world did not denounced or endorsed enough of the 40 Yemeni school youngsters besieged by a 227kg laser-guided bomb made by Lockheed Martin. One of a large number of arsenal sold to Saudi Arabia as a major aspect of billions of dollars of weapons from the United States. No agreements are lost, and the purchase of big missiles by the kingdom will continue as long as the Trump administration is making business deals. Then why bother one dead Saudi journalist. This clearly show us the hypocrisy, crocodile tears and the insincere condolences of the so-called civilized nations. The contemporary history of international criminal law commenced auspiciously with the Nuremberg trials in the outcome of the Second World War. For political causes, the plan of universally prosecuting those responsible for the most severe crimes promised by these trials was never finished and only God knows if the Saudi Arabia and it’s allies will be prosecuted one day because of what happened in Yemen. The Turkey who is main ally of the blocked Qatar have been threatening to shed light of the mutilated journalist, who is death sparked international outrage, which seems super facial sympathy compare to what the Saudi and their allies did to the Yemeni Civilians. While the whole world watches the horror and the horrendous images of Yemeni children and say nothing about it, can show us the double standard where the death of one single man outweighs a whole nation. The once hailed modernizing Mohamed Bin Salman, who lifted the ban on women driving, restored public theaters and restricted the power of the unpopular religious police has now blood in his hands. While I do not think the Saudi government will make a move against the chancery of Mohamed Bin Salman, the world must not overlook that Yemen is in extraordinary threat of man-made catastrophe.